This is a Dalek from the British series Dr. Who. That’s all I know about it. 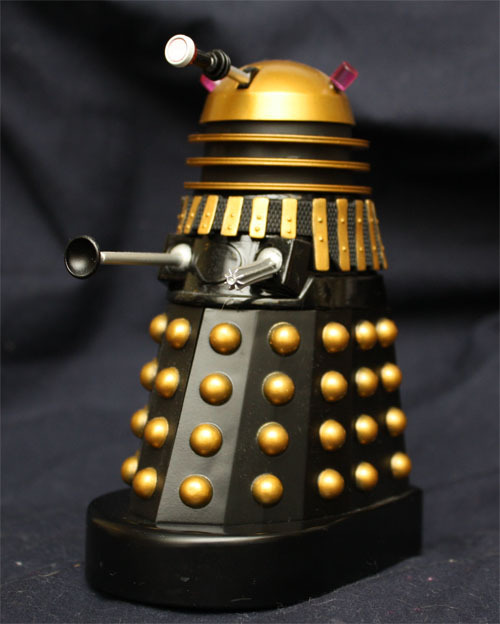 The picture I found online which I stole for this post had him labeled as the Supreme Dalek so I’m not sure if that means he’s better than regular Daleks or what. I have vague memories of the Dr. Who series from my childhood. He was a dude with an afro and a scarf that travelled around in a phone booth like Bill & Ted. It never much appealed to me. I know the series has a huge following and that it’s been on for decades. I think 12 or 13 actors have portrayed the good Doctor who I believe hops from body to body thus explaining the casting changes. Whatever. The only reason I have this thing is because as I mentioned in an earlier post I travelled to Europe a couple of years back. Being the nerd that I am I was determined to grab some sort of collectable from each country I visited that was representative of the area. I failed in this. I got a German language Simpsons comic in Austria and a Italian Spider-Man comic book in Italy. In Rome specifically I bought a couple of animal Gladiator figurines and in England I bought this guy. I bought a 3 pack of Daleks actually, a black one, a grey one and a silver one. I’ll try and research them a little more before I review another one of them. I found a decent sized store in England that sold Dr. Who memorabilia exclusively. It was pretty overwhelming and I had a hard time deciding what piece to buy. I thought about buying a single Dalek but I couldn’t decide on a color. I figured the 3 pack was the best was to go so that I wasn’t kicking myself when I got home for not buying a different one. This guy is cool I guess. No more or less so than R2-D2 I suppose. It’s pretty much the same idea, a garbage can on wheels. It looks like the source material and the articulation is as good as it’s gonna get on a thing like this. Its got wheels on the bottom, his head turns and all three of his phallic appendages are ball jointed (heh heh) so they can be pointed in any direction. He accomplishes his mission in that he reminds me of my trip whenever I look at him so what more can I ask for. 6 out of 10. Posted on December 30, 2011, in Miscellaneous. Bookmark the permalink. Leave a comment.